Canon EOS Reble T7i vs 77D vs T6i vs T6s, what's the difference? 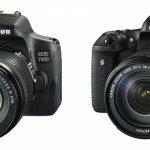 Home / Digital Camera Comparison / Canon EOS Reble T7i vs 77D vs T6i vs T6s, what’s the difference? 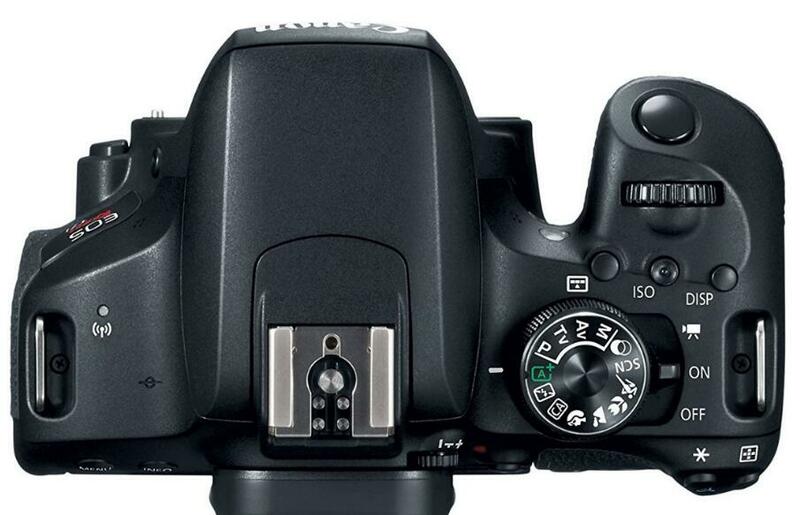 The latest product in the long chain of entry level Canon DSLRs are the Canon EOS Rebel T7i and EOS 77d. The origin of the Canon DSLRs can be traced back to the original EOS Digital Rebel that was introduced sometime in 2003. From then till date, all the updates and iterations following it have all been generally accepted as a market choice by both experienced and new users. The latest EOS Rebel T6i/T6s from Canon has proven to be a market best choice entry-level DSLRs. It comes with features that make it suitable for new users, while its polished handling makes its usability easy. The T7i and the 77D can be considered as two different models of the same product. While the T7i follows the model style of the classic Canon XX0D series in manipulation, the 77D takes 80D as an example, as it is not only equipped with a top LCD display but also has an installed Quick Canon Control dial, forming the classic double-command dial control style of Canon. The T7i is $150 cheaper than the 77D in listing price. 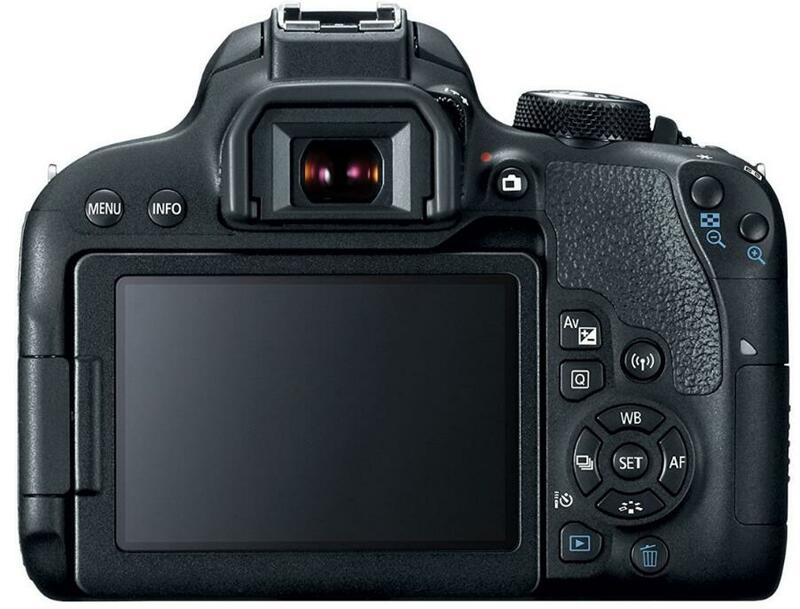 Because the top info LCD and Quick Control dial will completely change our habit of shooting, I think in situations where the buyer is not terribly price sensitive, we should select the enhanced version of the 77D instead of the T7i. Although the EOS Rebel T7i is very similar to the T6i, with many similar techs, the new model has been made by Canon to come with several appealing features and specifications that will make it the best choice for a newbie- some which first appeared on more premium models of EOS. Before taking a detailed look at any other thing, let’s compare the numbers for these cameras. 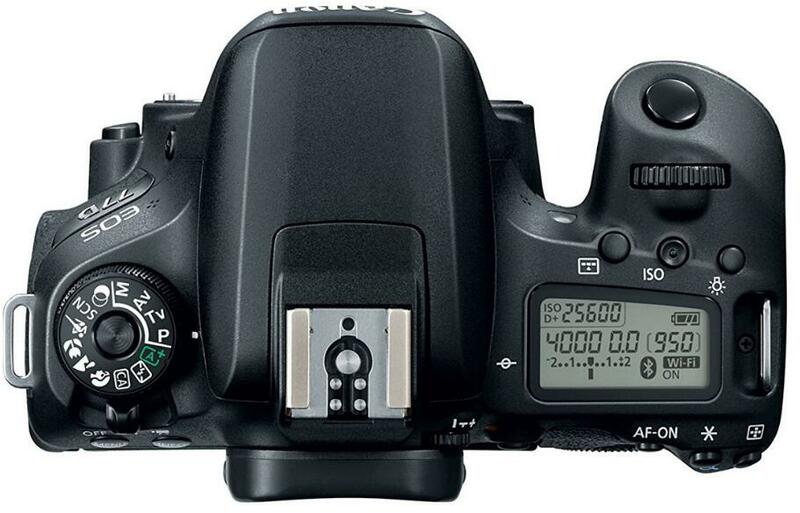 The sensor specs for most of new model APS-C DSLRs are the same, the 24.2 megapixel being the most noticeable. 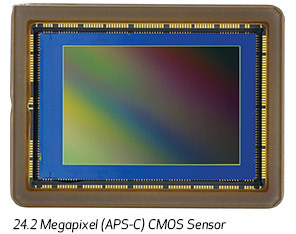 24 megapixels is common to almost all Canon’s APS-C. Though almost all the Canon’s full frame models have lower resolution than this, Canon has shown that they can produce high quality image with the 24.2 MP. It is important to note that the 24.2 MP imaging sensors come in different varieties in these cameras. Though the same 24.2MP resolution is found in both EOS Rebel T7i and Rebel T6i, some improvement has been done to the sensor of the T7i. The T7i has Dual Pixel AF which cannot be found in any of the older Rebels, In a screen view or on video, the Dual Pixel AF is very sensitive and allows a formidable track of objects. The T7i has the same excellent imaging sensor with EOS 80D, which can also be found in the EOS 77D. The changes made here were not specifically spelt out by Canon, but we deduce it uses an identical on-chip digital to analogue conversion mechanism to the one found in EOS 5 D Mark IV. I strongly believe that the resolution result that would be produced by the T7i and 80D would be similar because the same imaging sensor is used in both, and upgrade from T6i to T7i would not be done because of change in resolution but for other notable reasons. However, resolution would be a good reason for people using older Rebel models to upgrade. 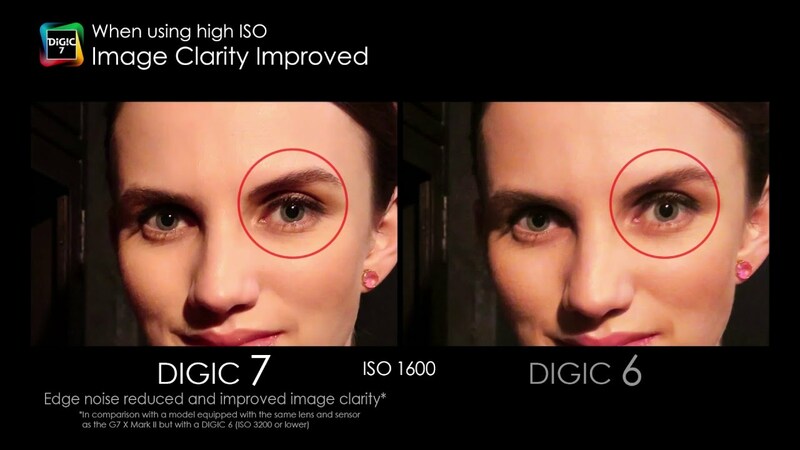 A new DIGIC 7 image processor is used with the new sensor. This is different from the DIGIC 7 chip present in Canon’s Powershot G7 x 11. According to Canon, this chip can process information 14 times what the DIGIC 6 processor would, this would ultimately result to better autofocus performance and an improved high-ISO noise performance. We would discuss about autofocus later. With native ISO100-25,600 range, Rebel T7i offers much more than the T6i which can be expanded to 51,200. Another minor improvement is that when the camera is put on Auto ISO setting, you can access the whole ISO100-25,600 native range when capturing still objects, you can access only ISO100-6400 in the older version. This reduces to a range of ISO100-12,800 when shooting videos. 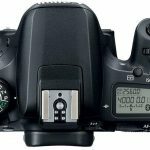 Canon featured its tested and trusted 19-point AF system in the EOS Rebel T6i, even though the AF system was beginning to look outdated irrespective of the fact that it was launched barely a few years ago. This model was changed for the Rebel T7i; Canon upgraded the coverage to 45 points from 10 points of T6i/T6s and also made all 45 points cross-type for more accurate AF, especially as regards continuous shooting and tracking of the subject. 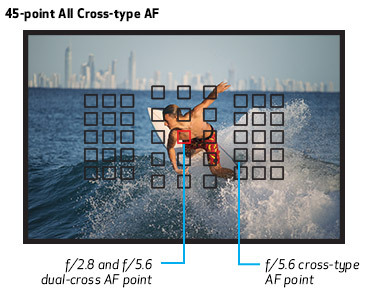 The benefit of cross-type sensor: Due to the fact that the cross-type sensors are sensitive in both the vertical and horizontal planes, the camera focusing is bound to lock onto its target, unlike sensors that are only sensitive to a plane, which implies that the person handling it may have to turn the camera in order to lock focus. The camera sensitivity also has some significant upgrade, focusing is sensitive down to -3EV, therefore there won’t be any problem when the light is poor, even at wider apertures down to f/8, 27 of the AF points are still sensitive- perfect if you intend making use of tele-converter and a fairly slow lens together. According to Canon, this camera offers the fastest live-view autofocus system in the world, with a speed of about 0.03 sec. one thing about claims as his is that it has to do with certain equipment and conditions: in this case, it is about the APS-C-equipped cameras that have phase-detect pixels on their sensors and was determined when the new EF-S 18-55mm f/4-5.6 IS STM is used at its 55mm setting. The new camera T7i offers a significance upgrade in burst depth and speed. The T7i also makes it possible for raw images to be processed right after capturing in the camera, a feature that the T6i lacks. The offer controls include noise reduction, adjustment of exposure and white balance. Canon still continued with its vari-angle, 3.0-inch touch screen display with a screen resolution of 1,040,000 dots. It would have been a great idea to enhance the resolution, though this is presently one of the most polished touch interfaces, so upgrading it might be unnecessary to Canon. Just like what is obtainable with the 80D, the capacitive touchscreen of the T7i makes Touch Focus during both Live View still photography and before/during video recording very possible. 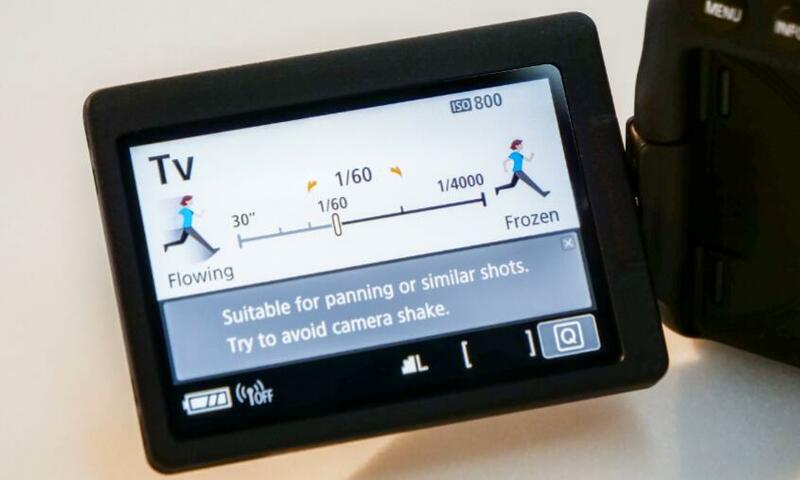 With a tap of your finger on the part of the LCD where you want the camera to focus-yah! That’s it very smooth. The touch Focus is very simple and stress free. With the current trend of 4k video capture being more or less a standard specification on cameras, particularly the rivals without mirrors that the Rebel T7i will have to compete with, it’s fairly disappointing to know that it offers only Full HD capture. The Rebel T7i can record HD movies up to Full HD (1,920 x 1,080 pixels) resolution with a rate of up to 60 frames in a second; this is twice the 30p maximum of the T6i. 24p and 30p rates are available as well on Full HD; however, the 25p rate available in the earlier camera is not available. A 30p or 60p option is offered at HD resolution (1,280 x 720 pixels) while the VGA (640 x 480) mode is presently pegged at 30 fps. One very interesting feature about the Rebel T7i is that canon made it with a 5-axis image stabilization system for shooting hand-held footage. It is not designed to work with stills rather it is designed to work with videos, the system counters unwanted movement of the camera, while the lenses equipped with IS will work with the system as well. Just like its predecessor, the Canon T6s, the Canon T7i can shoot high dynamic range movies as well, a feature that will be greatly appreciated in poor lighting situations. It can as well shoot time-lapse movies, this is a new feature introduced in the Rebel T6s and T6i. Both the T6i and the T7i have a polycarbonate and aluminium alloy construction which makes them extremely durable. The T7i is smaller and 33g lighter than its predecessor, Rebel T6i, and the same control layout is present, with the only difference being the rear controls setting changing in T7i. Amateur shooters can easily make use of the Rebel T7i with the aid of the new Guide Mode added to it. This explains different photographic techniques in a layman language. A new feature called Group photo determines the depth of field that is need to properly focus everyone in a group photoshoot, ands automatically choose the appropriate lens f-stop. In the T7i, there were improvement made to the NFC and Wi-Fi connectivity found in the T6i. It is now possible to stay connected to your camera using a remote device by establishing a low-power Bluetooth connection. This allows you to wake-up the camera from its sleep (if it hasn’t been fully turned off), and use your smartphone or tablet to remotely control the camera and browse photos. The Camera Connect app in the T7i has also been updated by Canon to make it user-friendly, and it is very useful in guiding a user through the controls. The EOS Rebel T6i permits peripheral illumination, correction of distortion and chromatic aberration to disabled and enabled when necessary once lenses that have compatible characteristics with the camera are used. Presently the T7i also feature an option that can correct the softening effect of diffraction. When shooting at smaller apertures, these effects being more obvious; this makes it appealing to the people who want to use the camera for landscapes as well as other small-aperture applications. The battery life has been greatly improved, and a good number of mirrorless competitors would struggle to compete with the 600 shots of t7i that up from the 440 shots of T6i. However, there is a “condition” using only the rear display will reduce the battery life to 270 shots. How to make the best choice? An introduction of a new flagship Rebel camera model by Canon is always the best ever. No doubt about this. However, the degree of “better” basically changes with every new model. Recommending the T5i over the T4i was a big challenge taking into consideration the big price difference. Luckily, the T6i came with more “better” features and it became a great choice among the Rebel series as well as among the mostly DSLR cameras. The two new AF systems (Dual Pixel AF system and 45 points traditional phase detection system) alone potentially make the T7i a better upgrade from the old T6i. An upgraded RAW image buffer depth and faster frame rate are also great improvements. Like we mentioned earlier, the omission of the 4k video capture is disappointing, besides that the T7i is potentially another company’s favorite for people using DSLR photography for the first time and want a great specification entry-level DSLR. The following I list a comparison of simple specifications between the T6i and T7i. If you don’t find any of these specs appealing, stick to the T6i or T6s. 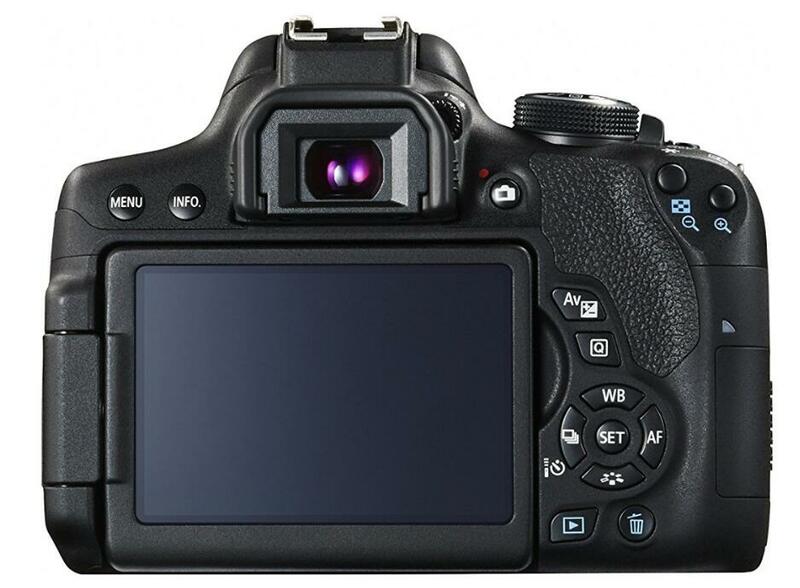 However, the T7i/77D has lots of advantages listed here that make the camera a top notch. For T7i and 77D, I think unless you are very sensitive to price, or there is no reason to choose the simplified version of the T7i (See Price on Amazon) but not the 77D; if your goal is the 80d, then please compare the T6s with the 80D. The camera at the 80D level will be in a more awkward position in the market in the future, especially in the case that it has the T6s below it, and the 7D Mark II above it. Previous 35mm vs. 50mm vs. 85mm comparison: What’s the difference and What fixed focal length lens should you choose? 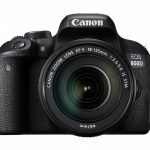 Canon EOS Rebel T7i vs EOS 77D vs EOS 80D, what’s the difference?